The National Civil Rights Museum is committed to providing educators with resources and materials for teaching the struggle for freedom and justice to students. These resources are tools for educators with tips for engaging with the museum on their visit as well as for bringing museum content into the classroom. Each educator resource will focus on an enduring idea and essential questions to broaden the scope of civil rights history. The resources will provide tools to engage students by prompting them to reflect on big questions about the human experience and how the history relates to contemporary events and everyday life. Careful attention is given to ensure the contents meet state standards of Tennessee, Arkansas, and Mississippi and Common Core. Additionally, the resources are meant to encourage character development by exploring and critiquing historical examples of strong character and relating it to the students' lives. The Gilder Lehrman Institute of American History and the National Civil Rights Museum are pleased to partner on a Teacher Seminar on The Civil Rights Movement, from July 9-15, 2017. The deadline to register is Monday, February 20, 2017. This seminar examines the historical origins of Black Power and its impact on the United States. Using Memphis, Tennessee, as a focal point, the seminar will explore the political, cultural, and economic elements of Black Power, and the impact of this ideology from the 1960s to the contemporary moment. This seminar is sponsored by Rhodes College and the National Civil Rights Museum. Seminar participants will visit the National Civil Rights Museum, and will also tour The Stax Museum of American Soul Music and Historic Beale Street. Participants will get an opportunity to gather information on digital resources and archival material that may be used in the creation of lesson plans and syllabi. These highly competitive one-week seminars are open exclusively to participants in the Institute’s free Affiliate School Program. Check here to see if your school is in the Affiliate School Program. If it is not, register here to ensure that you will be eligible to apply for the Teacher Seminars. Click to learn more and apply! Through the links below, educators can connect with trusted sites that may help them succeed. These links will open in another window and are not managed by the museum. COURAGE: This resource explores the definition of courage, and acts of courage as they appear throughout the exhibits. Comparisons of historical courageous efforts to examples from today are provided. View Courage Resource. View Courage PowerPoint presentation. 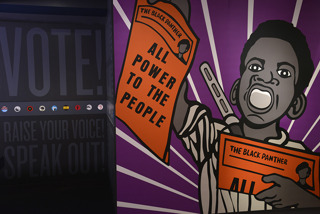 As a resource for both students and educators, the eLearning Sit-In activity is modeled after the museum's Standing Up By Sitting Down exhibit. Students will virtually walk through the protest experience through a series of questions. The lunch counter sit-ins are an example of the non-violent direct action strategy used by college students that spread across the U.S. in 1960. Click here for the Standing Up eLearning activity. Teacher's Guide for Standing Up by Sitting Down eLearning. This educational resource allows students to view the 1955-57 Montgomery Bus Boycott from the perspective of a newspaper investigative reporter. Students are guided through a series of bus stops where they are given scenarios of the unfair treatment and conditions under which blacks during a bus ride in Montgomery, AL. 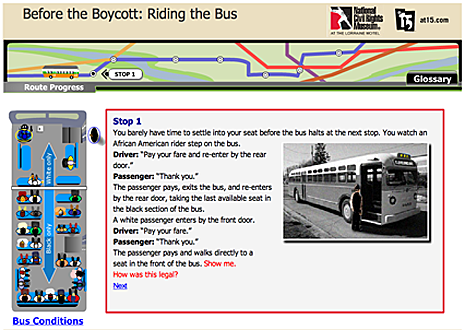 Click here for the Before the Boycott eLearning activity.